How can anybody resist a name that doubles up on the delicious?! Yes, there are really two words here, both that mean the same thing: “Yum”, and “Delicious”. Thus far, that’s been my experience with a variety of products that were sent to me for testing by Christina Hillard, the founder and owner of Yumlicious. 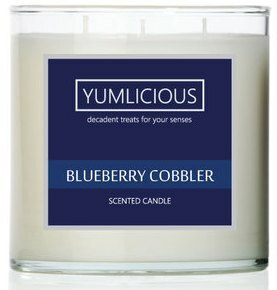 Yumlicious was started by Christina in 2002 when she was pregnant with her youngest son. She was told to take it easy…….. so she made candles! I love that! I don’t know about you, but I agree, anything having to do with candles is relaxing. Once she started, the rest was history and she opened a retail store a few years later. – – – Here is a fun fact about her store in Beavercreek, Ohio… you can watch the candle-making process right there with your own eyes. All her candles are hand poured by her right there in her store. How cool is that?? So if you happen to be in that area… definitely go check that out and say hello! Yumlicious products are offered in three different styles from 3-wick large and small candles to mason jars and last but not least for you melt lovers out there… scent bars. You can also now purchase handmade bath & body products which I’ll be reviewing on CandleScoop down the road. With the brand new launch of her redesigned website, Christina wanted to kick it off with a Candlefind review. FUN!! She sent me quite a variety of fragrances in candles and melts which I’ll be reviewing each separately… each fragrance will be listed on it’s own page below. Scent description for Banana Nut Bread: The mouth-watering aroma of oven fresh banana bread. This delicious combination of walnuts, ripe banana, vanilla, and a touch of spice is sure to spark your appetite. Infused with natural essential oils, including cinnamon and clove.